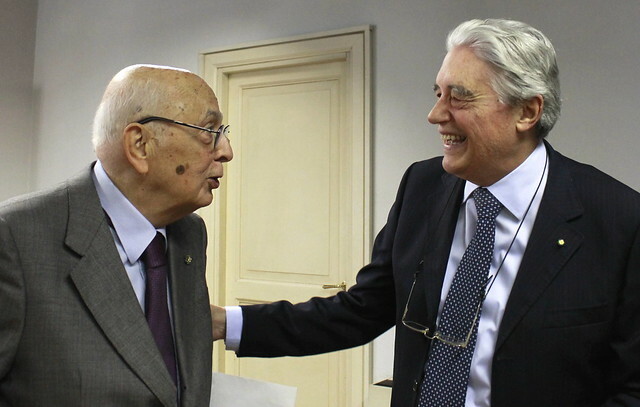 Italian senator and President Emeritus of the Republic, Giorgio Napolitano, visited the Institute to meet with IAI staff and researchers. A former member of IAI’s Executive Committee, Napolitano was briefed on the Institute’s recent activities by IAI president, Ambassador Ferdinando Nelli Feroci, and director Ettore Greco. Napolitano spoke about the current crises affecting the EU, the slowdown in Europe’s integration process, refugee flows and the UK’s referendum on Europe. On these last points, the former president highlighted the important support coming from US president Barack Obama during his recent visit to the UK and Pope Francis, whose activities on the refugee crisis were singled out as worthy of praise.